Flaugnarde, a sort of rustic custard reminiscent of classic cherry clafoutis, sweetened our breakfast table this week. It’s a simple dessert, flaugnarde. Fresh cream, wildflower honey, farm eggs and fruit. There’s beauty in simplicity, in the charming humility of foods in their fresh and naked state, bewitching in its shy luminescence. It’s perhaps Curnonsky who said it best when he wrote, “In cooking, as in the arts, simplicity is a sign of perfection.” Consider the utter perfection of a single ripe black cherry, just picked and still warm from the rays of the sun that nourished its ripening. Or a home-cured olive, rustic, salty and bitter, and the symbol of a real food lover’s true devotion to his or her craft. And while far from perfect, this flaugnarde recipe – rich and delicate and sweet – is, indeed, simple the way good food ought to be. You see, it’s about this time of year, mid-January, that my heart begins to ache for summer. I am, and I always will be a summer girl. I like to picnic by the river, spread my toes in fresh grass, count the wildflowers as they appear in the fields. The white ones come first, followed by the yellow mule’s ears and finally the pink and purple flowers appear. If you’re very lucky, you might catch a wild iris here or there near a marshy stream. I cherish the times spent with my husband and son hunting mushrooms, growing our farmers market, playing in the streams and searching for those ever-elusive wild irises. But, most of all, I love the fruits of summer: cherries and peaches, apricots and melons. Beyond those, however, are summer’s berries – the tiniest alpine strawberries that pack the flavor of an entire pint of conventional strawberries into a single berry the size of your fingernail, the wild raspberries that make such a luscious jam – that is, if you can withstand the temptation of eating them fresh long enough to cook them down with honey. And here, in this single humble recipe for a flaugnarde of roasted berries, I celebrate my favorite fruits – the last of the berries, frozen and packed away for winter. In a spoonful of this sweet and custard-like flaugnarde, I can once again taste summer – staving off my longing for another few months until the bees come around again, the flowers bloom and the berries hang heavy in the wilds. A flaugnarde diverges from its sister, the clafoutis, in one single way: where a clafoutis should only contain black sweet cherries while a flaugnarde may contain any fruit that the cook desires. So my blueberry clafoutis is, strictly speaking, not a clafoutis at all, but a flaugnarde like this dish. In addition to fruit, a flaugnarde typically contains eggs, cream and whole milk, a sweetener and a few tablespoons of flour which helps to bind the liquid ingredients together creating a very firm custard. In this version of flaugnarde, I’ve omitted the flour entirely not only to honor Nourished Kitchen’s gluten- and grain-free readers, but also because I wanted a spoonable dish, soft and milky and delicate. I’ve also roasted the berries first which helps to deepen their flavor and release their juices before their combined with cream and honey. Beyond the simple luxury of this dessert – though we often eat it for breakfast – this flaugnarde also offers nourishment in a way few other sweets do. Indeed, berries are a particularly good source antioxidants which we know from the essay on why you shouldbutter your vegetables are best absorbed with dietary fat, offered in plentiful beauty by both the fresh cream and farm eggs. Moreover, berries are a good source of lutein, a naturally occurring carotenoid, that is essential to healthy vision as it helps to keep the eyes safe from oxidative damage. Lutein, like many nutrients, is lipophilic; that is, it is fat-soluble and not water-soluble. For this reason, pairing lutein-rich foods with good wholesome fats may help your body to better absorb the nutrient and put it to good use. There’s a healthy beauty to the natural pairing of berries and cream. Fresh cream, particularly the cream of cows allowed to graze on pasture rather than corn- and soy-based feeds, is particularly rich in wholesome, health-protective fats including conjugated linoleic acid and trans-palmitoleic acid. Conjugated linoleic acid, found naturally in abundance only from butterfat and meat of grass-fed ruminants, is linked to a reduction in the risk of cancer while trans-palmitoleic acid is linked to a reduction in the risk of diabetes. Sadly, the amount of conjugated linoleic acid found in butterfat is greatly reduced when access to pasture is limited. So if you’re to reap the benefits of good quality fat, you need to ensure that the milk, cream and meat you consume comes from a pastured animal. Similarly, the eggs of hens allowed to peck and graze freely on pasture are also more nutrient-dense than the eggs of conventional hens raised in cramped battery cages, or even of hens raised in industrial “free-range” operations which only allow theoretical access to the outdoors. Nope, the eggs of truly pasture-raised hens are much different, indeed. A single pastured egg contains five times more vitamin D, three times more vitamin E, twice the amount of omega-3 fatty acids and seven times the amount of beta carotene as a conventional egg. In my area, a single pastured egg runs about fifty cents whereas a conventional egg costs about sixteen cents. 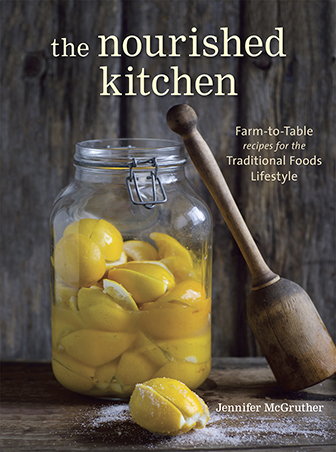 Let me tell you, if I’m getting three times the vitamin E and seven times the beta carotene as a conventional egg, that thirty-four cent difference is worth it which is why I only use pastured eggs in my flaugnarde, and in all my cooking. Flaugnarde, a sort of rustic custard reminiscent of classic cherry clafoutis. Preheat the oven to 400 degrees Fahrenehit (205 Celsius). 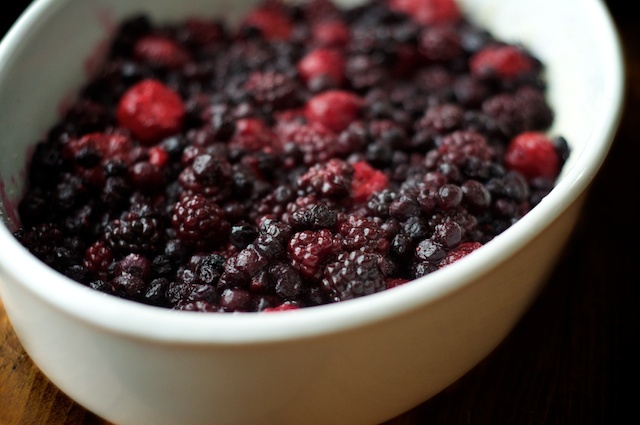 Toss berries with frambroise or vanilla extract and spoon into a baking dish. Roast the berries at 400 degrees Fahrenheit (205 Celsius) for twenty minutes or until they release the bulk of their juices, which not only improves the depth of flavor in the berries but also eliminates excess liquid which may cause the flaugnarde to be runny or to break easily. Reduce the oven’s temperature to 350 degrees Fahrenheit (175 Celsius). 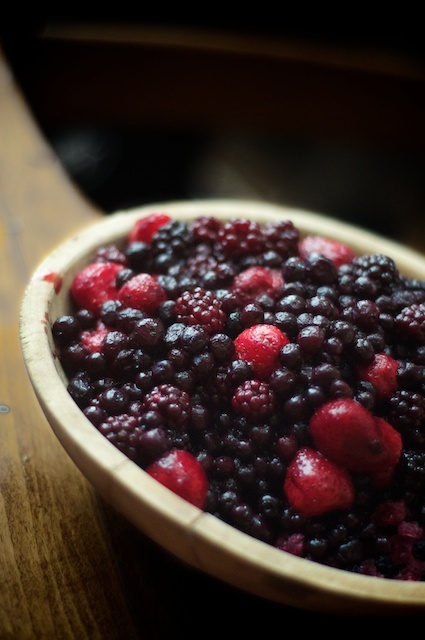 Remove the berries from the oven and strain through a fine mesh sieve, reserving juices for another use. While the berries strain, beat whole egg, egg yolks, heavy cream and honey together until they produce a smooth and uniform batter. Spoon strained berries back into the baking dish, add vanilla bean, if using, to the center of the berries and pour batter over the berries and bake at 350 degrees Fahrenheit (175 Celsius) for forty-five minutes or until the the flaugnarde browns, and the center trembles ever so slightly when touched. Allow the flaugnarde to cool, but serve warm. Oh my gosh, these all look SO good! You’ll love them. This version is a little liquidy – but we love the softness. I have made this before with berries and it was lovely but today I picked up some luscious black FGS at the farmers market so I am making a fig and blackberry version. We are going to have it with vanilla ice cream. Now THAT will be amazing. Figs are my favorite fruit. 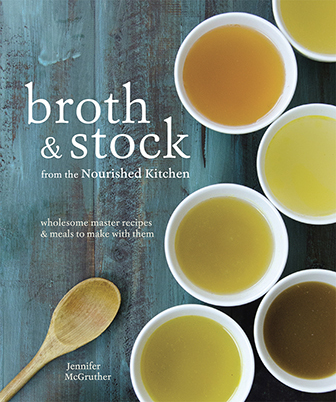 Fabulous recipe, beautifully-written post. I was just drooling as I read this. Can’t wait to try it! My son doesn’t do well with cow’s milk. 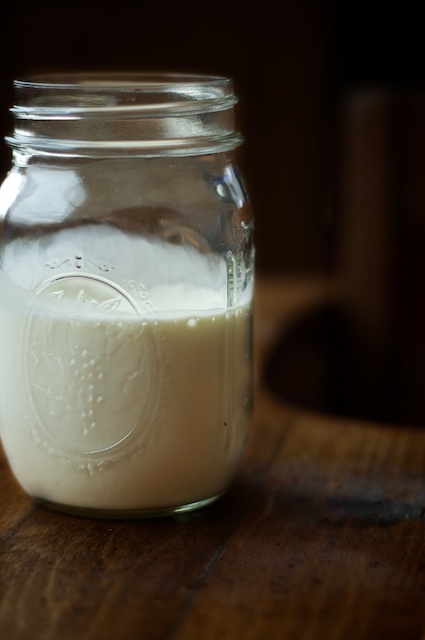 Would goat’s milk be an acceptable substitute or would it taste funky? He doe well with kefir. Would that work? What size dish gives you the best results? I’m heading to the raspberry patch in the am.